Hallux Valgus is a condition which affects the joint at the base of the big toe. The condition is commonly called a bunion. The bunion actually refers to the bump that grows on the side of the first metatarsophalangeal (MTP) joint. In reality, the condition is much more complex than a simple bump on the side of the toe. Interestingly, this condition almost never occurs in cultures that do not wear shoes. Pointed shoes, such as high heels and cowboy boots, can contribute to the of hallux valgus. Wide shoes, with plenty of room for the toes, lessen the chances of developing the deformity and help reduce the irritation on the bunion if you already have one. The term hallux valgus actually describes what happens to the big toe. Hallux is the medical term for big toe, and valgus is an anatomic term that means the deformity goes in a direction away from the midline of the body. So, in hallux valgus, the big toe begins to point towards the outside of the foot. As this condition grows worse, other changes occur in the foot that make the problem worse. 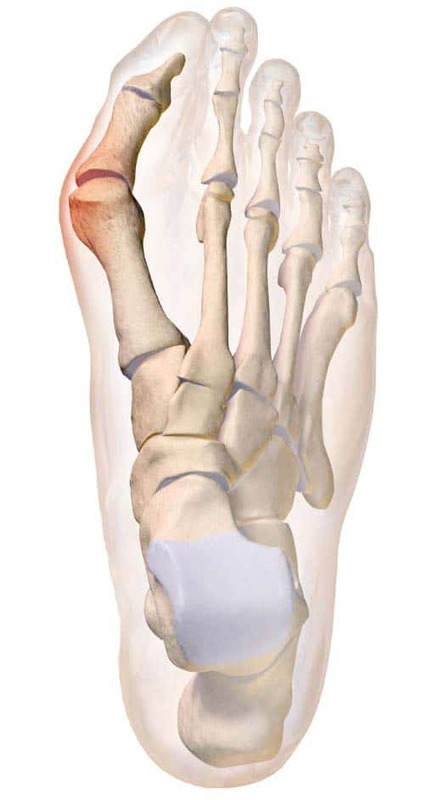 The bone just above the big toe, the first metatarsal, usually develops too much of an angle in the other direction. This condition is called metatarsus primus varus. Metatarsus primus means first metatarsal, and varus is the medical term that the deformity goes in a direction towards the midline of the body. This creates a situation where the first metatarsal and the big toe now form an angle with the point sticking out at the inside edge of the ball of the foot. The bunion that develops is actually a response to the pressure from the shoe on the point of this angle. At first the bump is made up of irritated, swollen tissue that is constantly caught between the shoe and the bone beneath the skin. As time goes on, the constant pressure may cause the bone to thicken as well, creating an even larger lump to rub against the shoe. Many problems that occur in the feet are the result of abnormal pressure or rubbing. A simple way of understanding what happens in the foot due to abnormal pressure is to view the foot simply. Our simple model of a foot is made up of hard bone, covered by soft tissue, that we then put a shoe on top of. Most of the symptoms that develop over time are because the skin and soft tissue are caught between the hard bone on the inside and the hard shoe on the outside. Any prominence, or bump, in the bone will make the situation even worse over the bump. Skin responds to constant rubbing and pressure and rubbing by forming a callous. The soft tissues underneath the skin respond to the constant pressure and rubbing by growing thicker. Both the thick callous and the thick soft tissues under the callous are irritated and painful. The answer to decreasing the pain is to remove the pressure. The pressure can be reduced from the outside by changing the pressure from the shoes. The pressure can be reduced from the inside by surgically removing any bony prominence. The symptoms of hallux valgus usually center around the bunion. The bunion is painful. The severe hallux valgus deformity is also distressing to many, and becomes a cosmetic problem. Finding appropriate shoe wear can become difficult, especially for women who desire to be fashionable, but have difficulty tolerating fashionable shoe wear. Finally, increasing deformity begins to displace the second toe upward, and may create a situation where the second toe is constantly rubbing on the shoe. Diagnosis begins with a careful history and physical examination by your doctor. This will usually include a discussion about shoe wear, and the importance of shoes in the treatment of the condition. X-rays will probably be suggested. This allows your doctor to measure several important angles made by the bones of the feet to help determine the appropriate treatment. Treatment of hallux valgus nearly always starts with adapting the shoe wear to fit the foot. In the early stages of hallux valgus, converting from a pointed toe shoe to a wider box toe shoe may arrest the progression of the deformity. The pain that arises from the bunion is due to pressure from the shoe. Treatment focuses on removing the pressure that the shoe exerts on the deformity. Wider shoes reduce the pressure on the bunion. Bunion pads may reduce pressure and rubbing from the shoe. There are also numerous devices, such as toe spacers, that attempt to splint the big toe and reverse the deforming forces. It is more likely that re-alignment of the big toe will also be necessary. The major decision that must be made, is whether or not the metatarsal bone will need to be cut and re-aligned as well. The angle made between the first metatarsal and the second metatarsal is used to make this decision. The normal angle is around 9-10 degrees. If the angle is 13 degrees or more, the metatarsal will probably need to be cut and realigned. There are two basic techniques used to cut and re-align the first metatarsal. In some cases, the far end of the bone is cut and moved laterally (distal osteotomy). This effectively reduces the angle between the first and second metatarsal bones. The bone is held in the desired position with a metal pin. Once the bone heals, the pin is removed. In other situations, the first metatarsal is cut at the near end of the bone (proximal osteotomy). The bone is re-aligned and held in place with metal pins until it heals. Again, this reduces the angle between the first and second metatarsal bones. Re-alignment of the big toe is then done by releasing the tight structures on the lateral side of the first MTP joint. This includes the tight joint capsule and the tendon of the adductor hallucis muscle. As you can see, this muscle tends to pull the big toe inward. The toe is realigned and the joint capsule on the medial side of the big toe is tightened to keep the toe straight. If you are experiencing bunions, contact Medical & Surgical Foot and Ankle Care and the medical treatment center of Dr Keith Naftulin DPM. We address all issues associated with bone, tendon, muscle, joints, cuticle and skin. You may also schedule an appointment with the doctor’s office on-line.